Thanks Mary C for the reply. are so old, a lot of the links in them are dead. Re: Questions about the windows. Brushy_Bill wrote: Weep Holes ... How big did you make yours, and how did you seal them? Did you use "the mix", or paint on the inside of them? I would be concerned about the edge of the canvas at the circumference of the hole. Folks spend time painstakingly wrapping and sealing edges and corners of the canvas, and then drill a hole through it. Is there any kind of "draft angle" (sorry, a casting/die making term) along the bottom exterior edges of the window openings to help keep water from running towards the glass? I drilled the hole slightly larger than the 5/32 (inner dia) brass tube that I epoxied into the hole. There is no way to get a Q-tip in tube that small but I find that a squirt from a spray bottle clears them very well. After the weep holes were drilled, the entire window is water proofed with "the mix". Then I epoxied the brass tubes in making sure to have plenty of epoxy and no gaps where water could infiltrate. Then Behr's best outdoor latex paint was used to paint the entire frame. I'm absolutely sure this solution will work for New Mexico but if I lived in Seattle, I might take more drastic waterproofing options. I think the board member Rowerwet has this style of windows and lives in a much wetter climate. Maybe he will weigh in? The problem in New Mexico is dust! We have no rot or rust but boy do we have dust! The canvas at the circumference for the window hole is doing great because I made sure it was glued down well before I cut the hole and then I spent more time making sure edge was glued down after the hole was cut. Again, this may be working well because I am in New Mexico but it does seem like it is really stuck down. No signs of the canvas edge trying to lift. I used an 18 degree slope for the tray that the window sits in so that the water would run back out. That's a steep angle in the plumbing world. I figured I would most always get the trailer to level within 15 degrees so even on a slope it would drain. When the windows are closed, a negligible amount of water even needs to drain. The window pane overlaps the hole by about .5 - .75 inches on all sides and even spraying it with the hose directly doesn't force much water between them. I haven't had them open in a blowing storm yet, but I have a several regular rain storms. Surprisingly little water makes it into the tray when the rain is coming straight down (more or less). I don't have a good drawing of the window design but here is one of my early shots at drawing one. I hope it helps. It doesn't look like the tray at the bottom is sloped but it is. I also didn't need the tabs at the top to keep the window from sliding up. The star denotes the rail that is removable because at the back of the trailer there isn't enough room to take the window pane out of the frame by taking it out the top. The sketch you provided will help. I was able to scale it to 14' long x 84"
Interior height is 6'4" at the highest point. There is no flat surface in the roof. sides from 6 sheets of foam. cores in a traditional size teardrop. 84" wide might be on the too wide side. Other than being cheap, I don't understand the love of the Wiley windows. Honestly, they're clunky and ugly, and in a tiny trailer, anything that sticks out like that...well, you're going to bang elbows or heads on it. Surely there's a better alternative, even on a budget build. Talia62 wrote: Other than being cheap, I don't understand the love of the Wiley windows. Honestly, they're clunky and ugly, and in a tiny trailer, anything that sticks out like that...well, you're going to bang elbows or heads on it. Surely there's a better alternative, even on a budget build. need to have screens for ventilation. 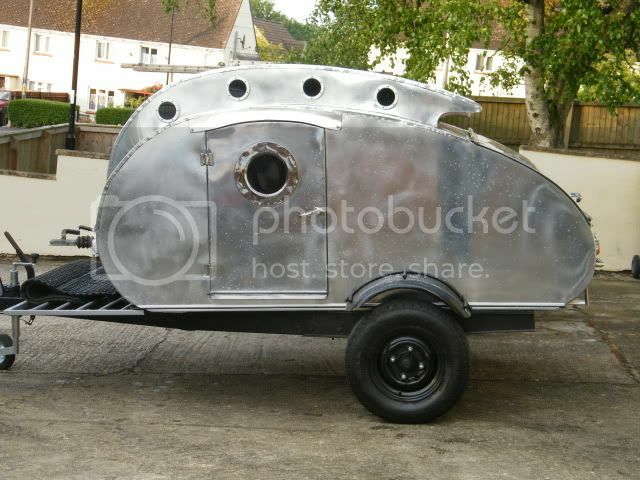 consider putting one is a 5 or 6 foot wide teardrop. off the shelf rectangular windows. conventional curtains on swing out windows. They leave something to be desired as far as aesthetics on the interior. They do intrude into the interior which may be of concern in the smaller teardrop trailers. Although I can't imagine a scenario in which I could possibly bump into one in my size trailer. They are not maintenance free. The weep holes need to be cleaned and the frames will need repainting from time to time. You can make them any size you want. You can make them any shape you want. You can take the pane all the way out and maximize the ventilation for that size opening. I used 1/4 acrylic panes so they should be difficult to break in a hail storm. Even if the rain is blowing horizontal and they are cracked open they drain and keep water out of the cabin. Curtains can be a challenge. Someone on the board (forgot who) built their curtain rod into the frame so that it was between the two wedges. I used a different solution by creating the magnetic travel posters. Depending upon your view of the window coverings that can be a pro or con. Personally, I really like the poster window coverings because it gives a character you can't get in a store bought trailer. In the end, I think it comes down to what you are trying to achieve. If you want a sleek very modern looking trailer (think Airstream) then they would be out of place. But if you want something simple and functional and you have the space for them, then I think the pros are hard to beat. Like Brushy_Bill, I spent some time searching and there aren't many options for round windows that open. How difficult would it be to make your own non-Wiley-style round windows that open? I can envision a simple round window hinged at the top so it can be opened towards the outside even in the rain. The screen issue could be easily addressed either by having the screen on a narrow frame that is hinged on the inside of the trailer, and opens to the inside for access to the window latch. Or, don't even hinge the screen, but mount flat rare earth magnets in the frame and just stick the screen to the wall. That would make a nice flush mount with nothing protruding into the inside of the trailer. Talia62 wrote: How difficult would it be to make your own non-Wiley-style round windows that open? Wow man, that got the brain cells all shuffled up. In order to not high jack this thread, I have started a thread to discuss your above ideas. Thanks for making a guy think Talia62. I know this is an old thread, but it is very inspirational. I am not a big fan of visible seams that can never be perfectly straight and just look sloppy. I know this canvasing method is not designed to be perfect, but I struggle with that. Maybe there is a little OCD involved. The finish of your canvas is the cleanest I have seen here. The way the seams overlap and end at the edge of the roof is really nice. My design will not have hard edges, but now I have seen what can be done.